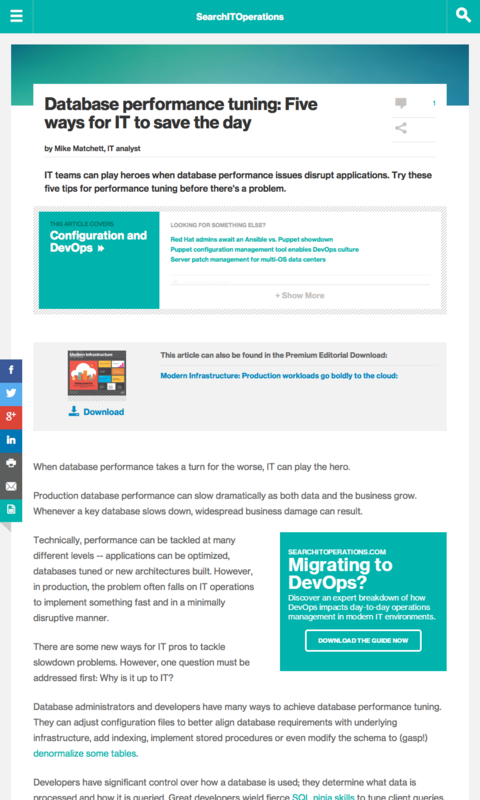 IT teams can play heroes when database performance issues disrupt applications. Try these five tips for performance tuning before there’s a problem. When database performance takes a turn for the worse, IT can play the hero. Production database performance can slow dramatically as both data and the business grow. Whenever a key database slows down, widespread business damage can result. Technically, performance can be tackled at many different levels — applications can be optimized, databases tuned or new architectures built. However, in production, the problem often falls on IT operations to implement something fast and in a minimally disruptive manner. There are some new ways for IT pros to tackle slowdown problems. However, one question must be addressed first: Why is it up to IT? Database administrators and developers have many ways to achieve database performance tuning. They can adjust configuration files to better align database requirements with underlying infrastructure, add indexing, implement stored procedures or even modify the schema to (gasp!) denormalize some tables. Developers have significant control over how a database is used; they determine what data is processed and how it is queried. Great developers wield fierce SQL ninja skills to tune client queries, implement caching and build application-side throttling. Or, they rewrite the app to use a promising new database platform, such as a NoSQL variant. All kinds of databases, however, can eventually suffer performance degradation at operational scales. Worse, many developers simply expect IT to simply add more infrastructure if things get slow in production, which clearly isn’t the best option. This entry was posted in Published Articles and tagged Database, database performance, IT Operations, Modern Infrastructure magazine, NoSQL, Performance, SearchDataCenter, Taneja Group by Mike. Bookmark the permalink.